I absolutely love Mexican food. It started in my early teens when my parents moved the family from South Dakota to Central California. Taco Bell isn't REAL Mexican food, but from that first crispy taco that fell apart as I munched it, I was hooked. Fortunately I ended up for several years in Southern California and found my way to restaurants and homes that fed me amazing food created with traditional ingredients. To this day I still have a love affair with this style of cooking. It's a little more challenging scratching this itch in Canada and the cookbooks I found never had quite that authentic feel to them even though the food was good. Then when I was down in Los Angeles for Christmas, I noticed my younger brother was working with one I had not seen before. He is married to a Mexican-American and for some reason, when the family gets together, the men usually end up cooking. He is probably one of the best cooks I know, so I knew this collection of recipes must be special. I made sure I emailed the name of the cookbook home so I could order a copy on my return. 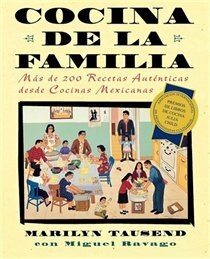 The book is called, Cocina De La Famila by Marilyn Tausend with Miguel Ravago and has won the Julia Child Cookbook Awards. In the introduction, the writer shares what I think is the key to why this book feels so authentic, "For much of the past 3 years I have traveled back and forth across the United States talking to hundreds of Mexican and Mexican-American cooks, hearing their stories and collecting their recipes. Seldom were the ingredients or instructions written down, but I learned from watching, listening and talking. Cocina de la Famila is the tale of these many cooks..."
While this takes several hours, most of it is just being there to check on it while cooking. It's not labour intensive in any way. Trim off excess fat from the outside of the meat leaving the thin inner strips. Cut into irregular chunks about 1-1/2 inches square. Place the meat in a wide, heavy pot such as a dutch oven. Cover with water by 1/2 inch - no more. Bring to a boil over medium high heat and skim off any foam that rises to the surface. Add onions, garlic, oregano, chiles and salt to taste. When the water begins to boil again, lower the heat and simmer, partially covered, about 1 hour until the meat is almost tender and liquid has evaporated. Stir occasionally. 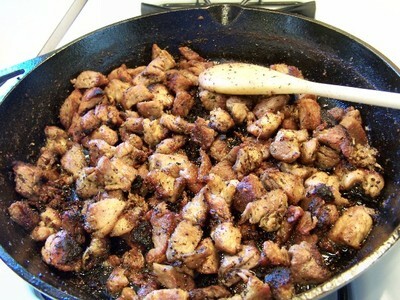 If there is still liquid in the pan when the meat is ready, turn up the heat and boil until liquid has evaporated. Watch carefully so that meat doesn't scorch. (Note - I found this took a LOT longer than 1 hour, not sure why). Preheat oven to 450 degrees F. Remove chiles form the pot (I took out the onion and whole garlic cloves as well and left just the meat). Place the meat in a single layer in a flat, oven proof baking dish. Add the Dr. Pepper, Orange Juice, Orange zest, pepper and salt if desired and mix well. Bake 30-40 minutes uncovered until the meat is crispy and glazed with the syrup. The meat will have to be stirred often because the sugar in the soda and orange juice will burn easily. Drain of any accumulated fat and put the carnitas in a serving dish. Scoup up with tortillas (you can shred a bit with a fork), top with salsa and guacamole (optional) and enjoy. 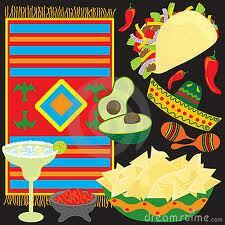 Note - some people preshred the meat and serve that way, others make the tacos with shredded lettuce, tomatos, etc. Some just like the meat by itself with or without the tortillas. The choice is yours. 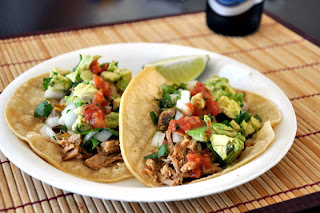 There are MANY versions of Carnitas out there and a wide variety of toppings. As with all cooking, it's about finding the version that best suits your taste.